adopted by school systems all across the country. You cannot predict a bleeding event, but you can prepare for one. 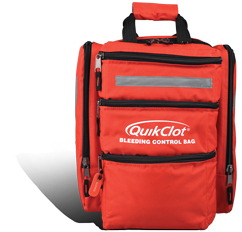 The QuikClot® Bleeding Control Bag® puts life-saving technology in your hands, giving you the power to treat multiple injuries should an event occur. ARE YOU PREPARED? EXPERTS ARE READY TO HELP TODAY. Uncontrolled bleeding is a major cause of preventable deaths. CAUTION: Certain QuikClot® products require medical oversight by a qualified licensed medical professional. 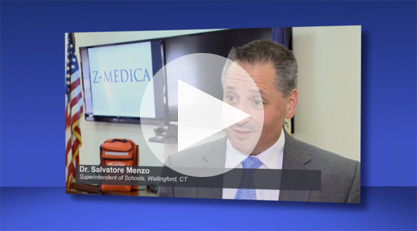 Please refer to product details, including instructions for use, and/or contact a Z-Medica sales representative. Kits and their configurations are subject to change without notice. Mass casualty events – acts of terrorism, natural disasters, or intentional acts of violence – require certain preparedness and response. Using QuikClot products in these situations can save lives by controlling bleeding. Curry N, Hopewell S, Doree C, Hyde C, Brohi K, Stanworth S. The acute management of trauma hemorrhage: a systematic review of randomized controlled trials. Crit Care. 2011;15(2):R92. Data compiled from multiple sources and on file. Blair, J. Pete, and Schweit, Katherine W. (2014). A Study of Active Shooter Incidents, 2000 - 2013. Texas State University and Federal Bureau of Investigation, US Department of Justice, Washington D.C. 2014.